Name Variation Anna Maria Schmitz was also known as Emma M.
Married Name circa 1879 As of circa 1879,her married name was Greenheck. Anna Maria Schmitz was born on 4 December 1850 at Wisconsin. She was the daughter of Mathias Joseph Schmitz and Christina Schmitt. Anna Maria Schmitz married Cornelius Greenheck, son of Hubert Greenheck and Agnes Roschen, circa 1879. Anna Maria Schmitz died on 1 August 1933 at age 82. Before 1895 Christina (Schmitt) Schmitz King with children. Anna Maria Schmitz had zero children. 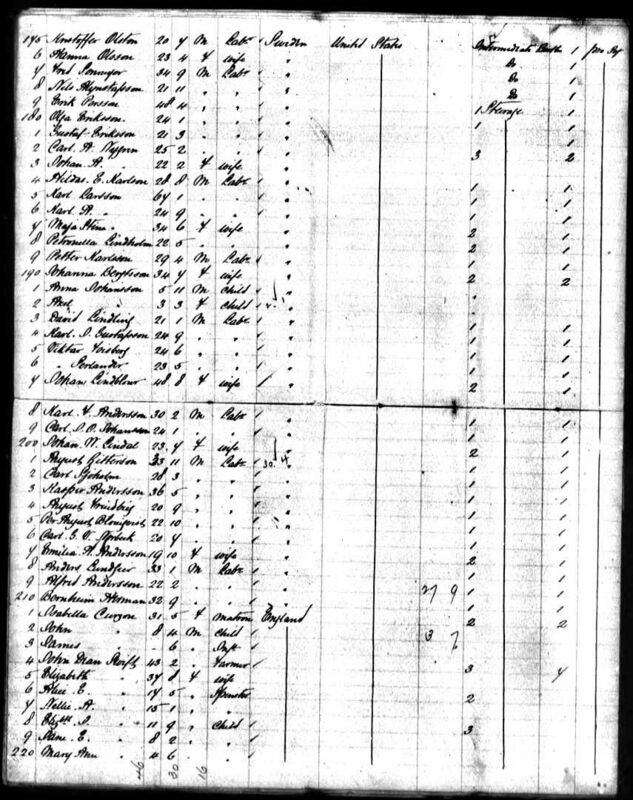 [S248] U.S. Federal Census 1860 U.S. Federal Census, by Ancestry.com, Page 156. Dwelling 1107. [S247] U.S. Federal Census 1870 U.S. Federal Census, by Ancestry.com, Page 22. Dwelling 159. 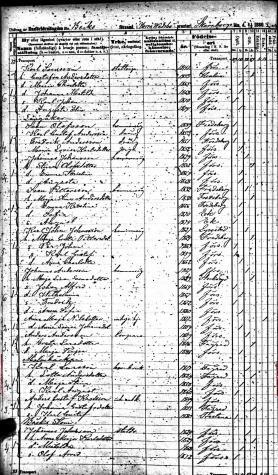 [S246] U.S. Federal Census 1880 U.S. Federal Census, by Ancestry.com, ED231. Page 1. Dwelling 8. Family History Library Film 1255445 NA Film Number T9-1445 Sheet 26A. [S244] U.S. Federal Census 1910 U.S. Federal Census, by Ancestry.com, ED110. Stamp 139. Dwelling 157. [S364] Wisconsin State Census Wisconsin State Censuses, 1895 and 1905, by Ancestry.com, Dwelling 52. 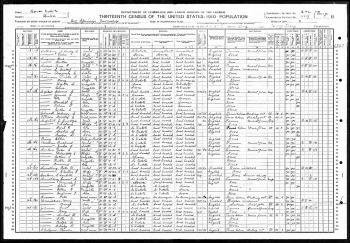 [S244] U.S. Federal Census 1910 U.S. Federal Census, by Ancestry.com, ED89. Dwelling 32. [S250] U.S. Federal Census 1930 U.S. Federal Census, by Ancestry.com, ED52-10. Dwelling 40. Name Variation Bridget Royal was also known as Royle. Name Variation Bridget Royal was also known as Rahill. Married Name Her married name was Byrne. Name Variation Bridget Royal was also known as Rhall. Bridget Royal married John Byrne. Bridget Royal was born circa 1815 at Ireland. She died between July 1870 and 1906 at Sauk, Wisconsin. Bridget Royal and John Byrne immigrated before 1850 The sailing vessel on which the family took passage was the "Lord Saunders," and the same was partially wrecked en route, nine weeks having been passed on the ocean. They landed in New Orleans. Bridget Royal migrated in 1859 at Ohio to, Wisconsin, in a trip made by wagon. [S249] U.S. Federal Census 1850 U.S. Federal Census, by Ancestry.com, Year: 1850; Census Place: Lancaster, Fairfield, Ohio; Roll: M432_677; Page: 293B; Image: 335. 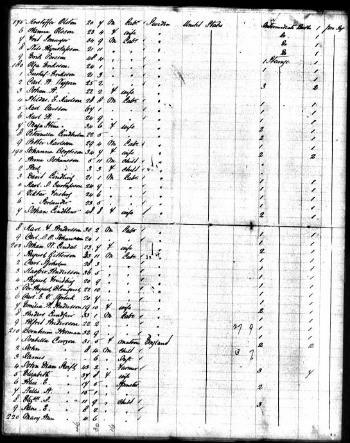 [S248] U.S. Federal Census 1860 U.S. Federal Census, by Ancestry.com, Page 191. Dwelling 1619. Written number 251. [S247] U.S. Federal Census 1870 U.S. Federal Census, by Ancestry.com, Page 6. Dwelling 42. John Byrne married Bridget Royal. John Byrne was born circa 1797 at Ireland. He died after July 1870. John and Bridget (Royle) Byrne, who came to America in 1843, when Mrs. (Mayr Byrne) Mehan was twelve years of age. Her father (John) had been a farmer and stock shipper in Ireland. The sailing vessel on which the family took passage was the "Lord Saunders," and the same was partially wrecked en route, nine weeks having been passed on the ocean. They landed in New Orleans and a year later removed to Fairfield county, O., where they remained until 1859, when they came to Richland county, Wis., settling in Westford township, where Mr. Byrne reclaimed a good farm, and there passed the remainder of his life. His widow died in Sauk county. Of their eight children Mrs. Mehan is the eldest; Alice is the wife of James Giblin, of Sauk county; Bridget is the wife of Daniel O'Hara, of Spaulding, Neb; Francis is a farmer in Sauk county, Wis; Ann is the wife of Frank Byrne, and they reside in Kansas; Ellen lives at Ironton, Sauk county; Catherine died in Ohio; and Philemon died before the immigration to America. John Byrne and Bridget Royal immigrated before 1850 The sailing vessel on which the family took passage was the "Lord Saunders," and the same was partially wrecked en route, nine weeks having been passed on the ocean. They landed in New Orleans. John Byrne migrated in 1859 at Ohio to, Wisconsin, in a trip made by wagon. Ann E. Byrne was born in August 1844 at Ireland. She was the daughter of John Byrne and Bridget Royal. Ann E. Byrne married Francis S. Byrne circa 1862. Ann E. Byrne died after June 1900. 1 March 1885 Cottonwood, Chase, Kansas Ann E. Byrne appeared on the census of 1 March 1885 in the household of Francis S. Byrne at Cottonwood, Chase, Kansas. John Byrne witnessed the migration in 1859 at Ohio to, Wisconsin; in a trip made by wagon. Ann E. Byrne had 9 with 8 living in 1900 children. [S245] U.S. Federal Census 1900 U.S. Federal Census, by Ancestry.com, Year: 1900; Census Place: Grant, Marion, Kansas; Roll T623_ 488; Page: 1A; Enumeration District: 90. Ellen Byrne was born circa 1855 at Ohio. John Byrne witnessed the migration in 1859 at Ohio to, Wisconsin; in a trip made by wagon. 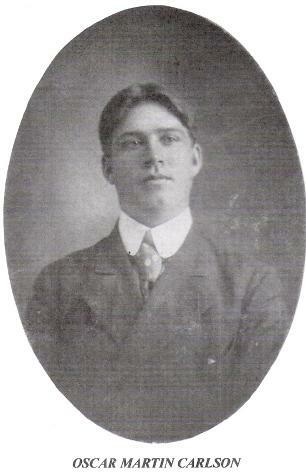 Jacob Devos was born circa 1875 at Wisconsin. He was the son of Jacob Devos and Rosina (?). [S246] U.S. Federal Census 1880 U.S. Federal Census, by Ancestry.com, ED152. Page 14. Dwelling 114. Mary Devos was born circa 1877 at Wisconsin. She was the daughter of Jacob Devos and Rosina (?). Julia Scallon was born circa 1904 at Wisconsin. She was the daughter of William Scallon and Julia (?). [S243] U.S. Federal Census 1920 U.S. Federal Census, by Ancestry.com, ED164. Dwelling 7. [S250] U.S. Federal Census 1930 U.S. Federal Census, by Ancestry.com, ED56-29. Dwelling 256. Hugh Scallon married Mary McKeegan. Hugh Scallon was born on 20 March 1823 at Canada. He was buried in 1884 at St Patricks Cemetery (old), Bear Creek, Sauk, Wisconsin. 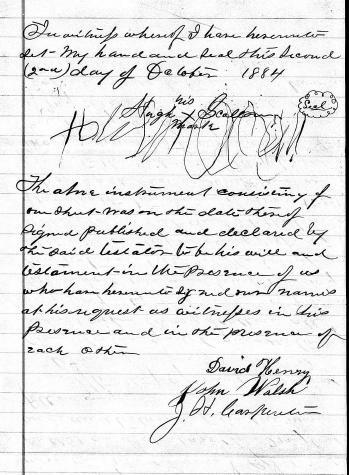 Hugh Scallon left a will on 2 October 1884 at Sauk, Wisconsin. [S247] U.S. Federal Census 1870 U.S. Federal Census, by Ancestry.com, Page 15. Stamp 85. Dwelling 116. [S246] U.S. Federal Census 1880 U.S. Federal Census, by Ancestry.com, ED251. Page 18. Dwelling 161. Married Name Her married name was Scallon. Mary McKeegan married Hugh Scallon. Mary McKeegan was born in 1821 at Ireland. She was buried in 1911 at St Patricks Cemetery (old), Bear Creek, Sauk, Wisconsin. 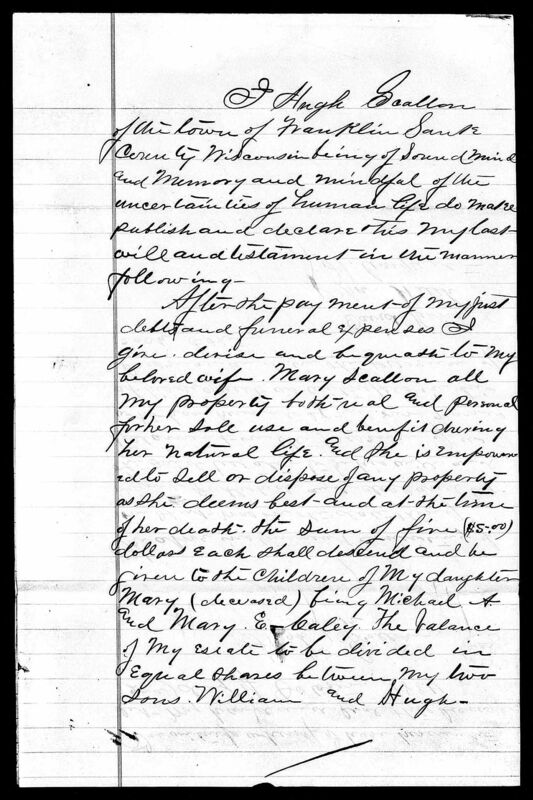 In Hugh Scallon's will dated 2 October 1884 at Sauk, Wisconsin, Mary McKeegan was named as an heir. Hugh Scallon married Bertha (?). Hugh Scallon was born in 1859 at Illinois. He was the son of Hugh Scallon and Mary McKeegan. 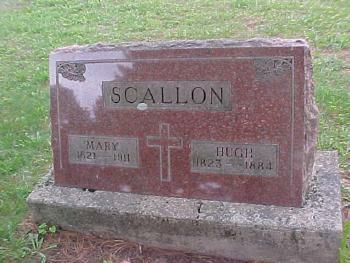 Hugh Scallon died in 1936. In Hugh Scallon's will dated 2 October 1884 at Sauk, Wisconsin, Hugh Scallon was named as an heir. Married Name Her married name was Kaley. Mary Scallon married (?) Kaley. Mary Scallon was born circa 1857 at Illinois. She was the daughter of Hugh Scallon and Mary McKeegan. Mary Scallon died before October 1884. (?) Kaley was born at Canada. He married Mary Scallon, daughter of Hugh Scallon and Mary McKeegan. Michael A. Kaley was born circa 1875 at Wisconsin. He was the son of (?) Kaley and Mary Scallon. 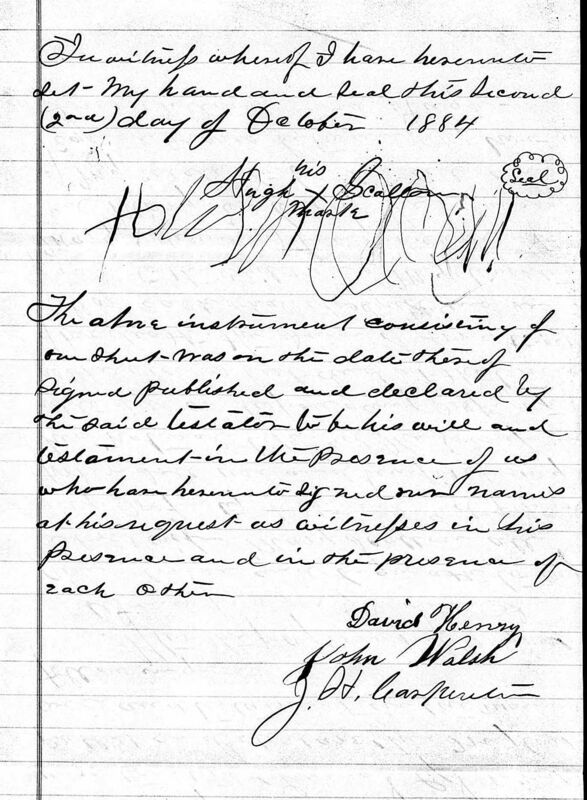 In Hugh Scallon's will dated 2 October 1884 at Sauk, Wisconsin, Michael A. Kaley was named as an heir. Mary E. Kaley was born circa 1877 at Wisconsin. She was the daughter of (?) Kaley and Mary Scallon. 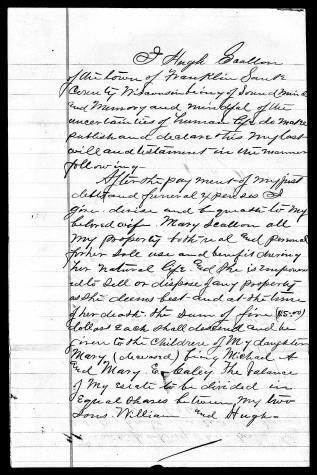 In Hugh Scallon's will dated 2 October 1884 at Sauk, Wisconsin, Mary E. Kaley was named as an heir. Ruth B. (?) married Joseph Harold Scallon, son of William Scallon and Julia (?). Ruth B. (?) was born in 1897. Mary K. Scallon was born in 1931. 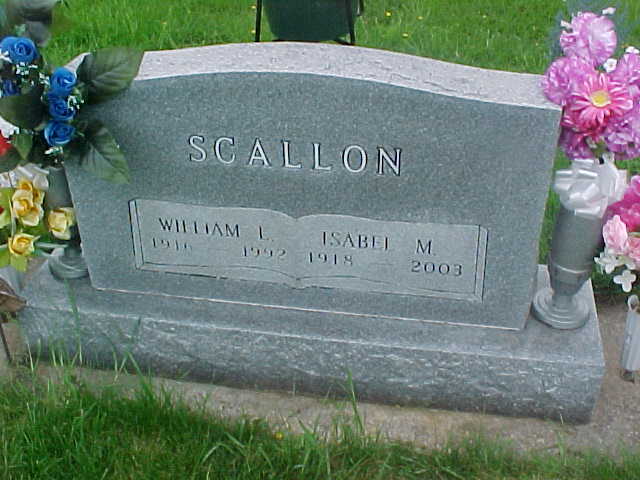 She was the daughter of Joseph Harold Scallon and Ruth B. (?). Mary K. Scallon died in 1960. Isabel M. (?) married William L. Scallon, son of Frank Lawrence Scallon and Winifred Catherine Phelan. Isabel M. (?) was born in 1918. She was buried in 2003 at St. Patrick's Catholic Cemetery; New Loreto, Bear Creek, Sauk, Wisconsin. Willie Krueger was born in 1902. He married Ruth Ida Emma Steinweg, daughter of Albert Adolph Steinweg and Lydia Magdalene Meyer, on 3 September 1932. Willie Krueger died on 18 March 1963. Name Variation Lorenz August Alfred Droes was also known as Lawrence. Name Variation Lorenz August Alfred Droes was also known as Larry. Lorenz August Alfred Droes married Burgess Peck, daughter of Matthew Peck and Bessie (? ), at first marriage for him. Lorenz August Alfred Droes was born on 15 August 1904. He was the son of Frederick William Droes and Alma Emma Luehrsen. Lorenz August Alfred Droes married Ruth Ida Emma Steinweg, daughter of Albert Adolph Steinweg and Lydia Magdalene Meyer, on 10 January 1970 at second marriage for Ruth. Lorenz August Alfred Droes died on 31 January 1975 at age 70. Lorenz August Alfred Droes obtained US Social Security Card at Wisconsin; last residence Reedsburg, Sauk, Wisconsin. [S244] U.S. Federal Census 1910 U.S. Federal Census, by Ancestry.com, ED86. Dwelling 178. [S243] U.S. Federal Census 1920 U.S. Federal Census, by Ancestry.com, ED150. Dwelling 25. Name Variation Karl Larsson was also known as Karl Karlson. Name Variation Karl Larsson was also known as Carl. Name Variation Karl Larsson was also known as Carl Carlson. Karl Larsson was born on 10 June 1817 at Fägre, Skaraborg (Västra Götaland), Sweden, also reported as 1819. He was the son of Lars Aronsson and Christina Svensdotter. Karl Larsson married Charlotta Andersdotter, daughter of Anders Eriksson and Kiersten Svensdotter, on 7 January 1848 at Fagre, Skaraborg, Sweden. Karl Larsson died on 6 March 1905 at USA at age 87. 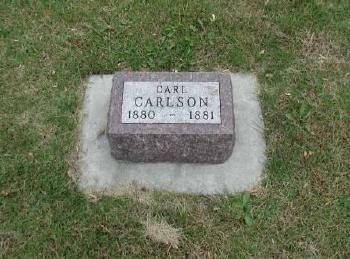 He was buried after 6 March 1905 at Union Creek Cemetery, Union, South Dakota, listed as Carl Carlson. 1 June 1885 Charles Mix, South Dakota He is listed as father on the census of 1 June 1885 in the household of Anders Gustav Carlsson at Charles Mix, South Dakota; surname listed as Karlson. Notes: Travels with family. He and Charlotta Andersdotter immigrated on 4 April 1884 to S. S. Orlando, Hull, England, also includes Anders Gustaf Karlsson family. [S388] Swedish Church Records Archive; Census Records, Roll/Fiche Number: SC-1413; Volume Number: 47. Lars Aronsson was born on 29 September 1773 at Fagre, Skaraborg, Sweden. He was the son of Aron Larsson and Britta Svensdotter. Lars Aronsson married Christina Svensdotter, daughter of Sven Jeansson and Kiersten Larsdotter, on 29 September 1802. Lars Aronsson died on 23 March 1845 at "Attereed", Back, Skaraborg, Sweden, at age 71. Aron Larsson married Britta Svensdotter. He was the son of Gustaf Gustafsson and Cajsa Pehrsdotter. Gustaf Gustafsson married Kajsa Lisa Larsdotter, daughter of Lars Larsson and Ingrid Andersdotter, on 5 December 1845 at Hjälstad, Skaraborg (Västra Götaland), Sweden. Gustaf Gustafsson married Britta Maria Larsdotter on 23 June 1871. [S388] Swedish Church Records Archive; Census Records, Roll/Fiche Number: SC-1413; Volume Number: 48. [S388] Swedish Church Records Archive; Census Records, Roll/Fiche Number: SC-1417; Volume Number: 52; Page Number: 5. Name Variation Kajsa Lisa Larsdotter was also known as Cajsa Lisa. Married Name 5 December 1845 As of 5 December 1845,her married name was Gustasfsson. Married Name 5 December 1845 As of 5 December 1845,her married name was Gustafsson. Kajsa Lisa Larsdotter married Gustaf Gustafsson, son of Gustaf Gustafsson and Cajsa Pehrsdotter, on 5 December 1845 at Hjälstad, Skaraborg (Västra Götaland), Sweden. Kajsa Lisa Larsdotter died on 12 January 1870 at Trästena, Skaraborg (Västra Götaland), Sweden, at age 47. Name Variation Augusta Carlsdotter was also known as Carlsson. Augusta Carlsdotter was born on 14 April 1855 at Sweden. She was the daughter of Karl Larsson and Charlotta Andersdotter. Name Variation Charlotta Andersdotter was also known as Lotta. Name Variation Charlotta Andersdotter was also known as Lottie. Married Name 7 January 1848 As of 7 January 1848,her married name was Larson. Married Name 7 January 1848 As of 7 January 1848,her married name was Karlson. Married Name 7 January 1848 As of 7 January 1848,her married name was Carlson. Married Name 7 January 1848 As of 7 January 1848,her married name was Larsson. Charlotta Andersdotter was born on 24 February 1824 at Mockeltorp, Ekeskog, Skaraborg, Sweden, also reported as Ballefors; also reported as Fägred. She was the daughter of Anders Eriksson and Kiersten Svensdotter. Charlotta Andersdotter married Karl Larsson, son of Lars Aronsson and Christina Svensdotter, on 7 January 1848 at Fagre, Skaraborg, Sweden. Charlotta Andersdotter died on 13 March 1918 at Union, South Dakota, at age 94 Old Mrs. Carlson, who was obliged to spend her last years at the Union County poor farm, passed away there last week. Rev. Johnson conducted the funeral last Friday afternoon at the Union Creek Church, where she was laid to rest by the side of her husband, who died several years ago. 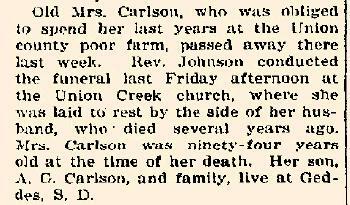 Mrs. Carlson was ninety-four years old at the time of her death. Her son, A.G. Carlson, and family, live at Geddes, S.D. She was buried after 13 March 1918 at Union Creek Cemetery, Union, South Dakota, listed as Charlotta Carlson. 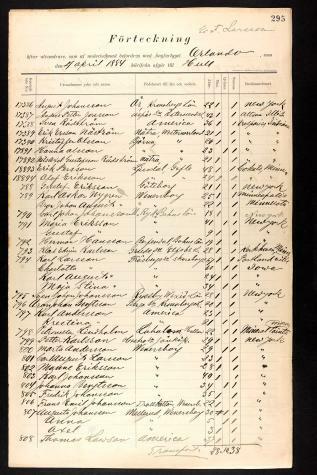 1 June 1885 Charles Mix, South Dakota Charlotta Andersdotter is listed as mother on the census of 1 June 1885 in the household of Anders Gustav Carlsson at Charles Mix, South Dakota; surname listed as Karlson. 1905 South Dakota Charlotta Andersdotter appeared on the census of 1905 at South Dakota Arrival Year in US and State: 1884; listed as widowed (husband died March 1905). 1915 South Dakota She appeared on the census of 1915 at South Dakota listed as widowed; Religion: Lutheran; sheet 109. Notes: Travels with family. 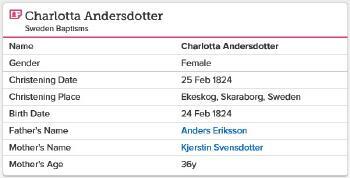 Charlotta Andersdotter and Karl Larsson immigrated on 4 April 1884 to S. S. Orlando, Hull, England, also includes Anders Gustaf Karlsson family. At Union Creek Lutheran Church, Sioux Valley, Union, South Dakota, Church Member Roll. 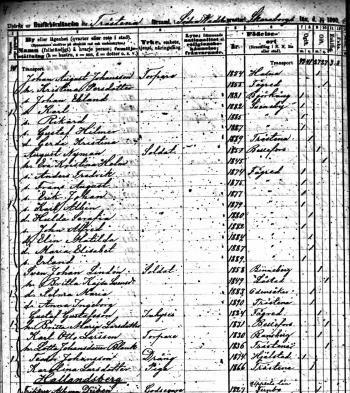 [S387] Family Search; Multiple Records, "Sweden Baptisms, 1611-1920," database, FamilySearch (https://familysearch.org/ark:/61903/1:1:FKCN-K78 : 9 December 2014), Charlotta Andersdotter, 24 Feb 1824; citing , reference ; FHL microfilm 154,718. [S390] Swedish Church Records Archive; Baptism Records, FHL Film Number: 154718. [S244] U.S. Federal Census 1910 U.S. Federal Census, by Ancestry.com, Year: 1910; Census Place: Big Springs, Union, South Dakota; Roll: T624_1489; Page: 7B; Enumeration District: 0424; FHL microfilm: 1375502. Name Variation Carl Gustav Carlson was also known as Carl Gustaf Carlsson. Name Variation Carl Gustav Carlson was also known as Karl Gustav Andersson. He was the son of Anders Gustav Carlsson and Johanna Gustafsdotter. Carl Gustav Carlson died in May 1881 at on S.S. Abyssinia crossing Atlantic Ocean to America. He was buried after May 1881 at Union Creek Cemetery, Union, South Dakota. [S389] Swedish Church Records Archive; Birth Records, Swedish Church Records Archive; Johanneshov, Sweden; Sweden, Indexed Birth Records, 1880-1920; GID Number: 100016.102.40600; Roll/Fiche Number: SC-950; Volume: :695; Year Range: 1880. Name Variation Oscar Martin Carlson was also known as Karlson. Oscar Martin Carlson was born on 19 April 1882 at Union, South Dakota. Oscar Martin Carlson married Margaret Jane Moles, daughter of Edward Achillis Moles and Martha Jane Roe, on 10 April 1907 at Geddes, Charles Mix, South Dakota. 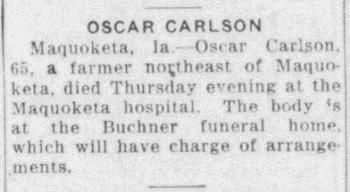 Oscar Martin Carlson died on 1 January 1948 at Jackson County Hospital, Maquoketa, Jackson, Iowa, at age 65 Oscar Martin Carlson obituary. 1 June 1885 Charles Mix, South Dakota Oscar Martin Carlson appeared on the census of 1 June 1885 in the household of Anders Gustav Carlsson at Charles Mix, South Dakota; surname listed as Karlson. 1895 Forbes Town, Charles Mix, South Dakota Oscar Martin Carlson appeared on the census of 1895 in the household of Anders Gustav Carlsson at Forbes Town, Charles Mix, South Dakota. [S245] U.S. Federal Census 1900 U.S. Federal Census, by Ancestry.com, ED80. Dwelling 141. Name Variation Marie Josephine Carlson was also known as Mary. Name Variation Marie Josephine Carlson was also known as Maria. Married Name 19 April 1905 As of 19 April 1905,her married name was Paddock. Married Name before December 1958 As of before December 1958,her married name was Larson. Marie Josephine Carlson was born on 22 January 1887 at Platte, Charles Mix, South Dakota. Marie Josephine Carlson married Frank Shultz Paddock, son of John Barney Shultz and Theresa Amelia Walker, on 19 April 1905 at Geddes, Charles Mix, South Dakota. Marie Josephine Carlson married (?) Larson before December 1958. Marie Josephine Carlson died on 18 October 1965 at Selah, Yakima, Washington, at age 78. 1895 Forbes Town, Charles Mix, South Dakota Marie Josephine Carlson appeared on the census of 1895 in the household of Anders Gustav Carlsson at Forbes Town, Charles Mix, South Dakota.